Among the social sciences, anthropology relies most fundamentally on "fieldwork"—the long-term immersion in another way of life as the basis for knowledge. 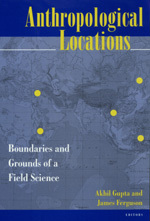 In an era when anthropologists are studying topics that resist geographical localization, this book initiates a long-overdue discussion of the political and epistemological implications of the disciplinary commitment to fieldwork. These innovative, stimulating essays—carefully chosen to form a coherent whole—interrogate the notion of "the field," showing how the concept is historically constructed and exploring the consequences of its dominance. The essays discuss anthropological work done in places (in refugee camps, on television) or among populations (gays and lesbians, homeless people in the United States) that challenge the traditional boundaries of "the field." The contributors suggest alternative methodologies appropriate for contemporary problems and ultimately propose a reformation of the discipline of anthropology. Akhil Gupta is Assistant Professor of Anthropology at Stanford University. James Ferguson is Associate Professor of Anthropology at the University of California, Irvine.